This was an outstanding soup. I’ll post the recipe tomorrow. UPDATED: Here it is. I want to first characterize this soup. (I do this for me. I can’t possibly remember all of these soups if I don’t write about my impressions.) I’ll begin by reporting that I came across a great big chunk of German Green Tomato. Even after several months in the deep freezer, I can taste the difference. That’s Big. The carrots and celery were store-bought. The peppers were homegrown. The Minute Rice (insert trademark thing here) that was tossed in after many hours of slow cooking sopped up some liquid and provided some starch. The pesto of homegrown dried basil and whatnot was a nice flavor addition. By happenstance, it turned out to be a truly outstanding soup for a warmish evening in January in Mississippi. Not all January evenings are warm in Mississippi.This one was, and so we enjoyed a beer with friends on the balcony of a bar in downtown not Oxford before we returned back to the Farm and Contestant #5, an outstanding soup. 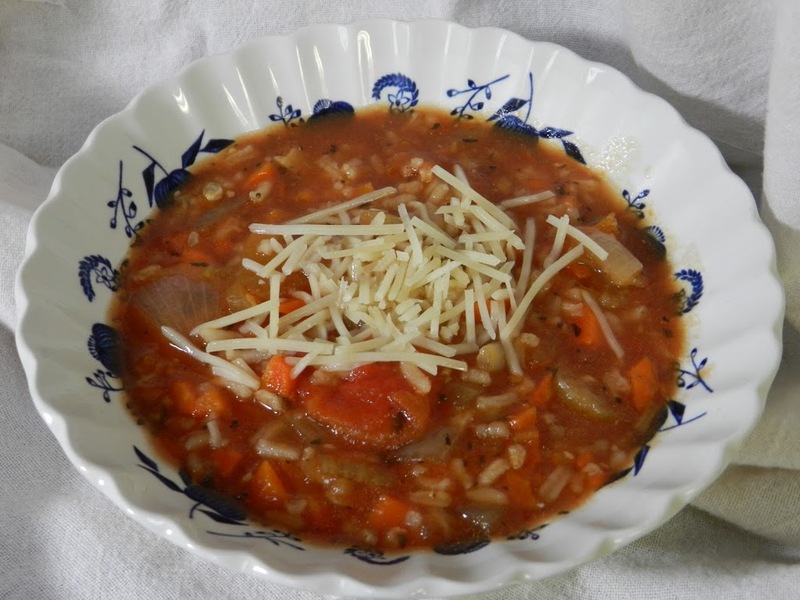 This is the 5th entry in The Fall/Winter Soup Contest. Mr. Big Food asked me where I ranked it. So, first of all [BEGIN ARGUMENT], after the first two, we hadn’t been ranking. It was the previous winner vs. this night’s contestant. (There’s been some distension. I think we were tied going into tonight’s supper.) But I thought about it, and I ranked it #4. Keep in mind that we make the rules up as we go along. It’s an excellent soup, but it doesn’t cut it in the Fall/Winter Soup Contest. It would stand a decent chance in the Late Winter/Early Spring Soup Contest. In April, substitute home grown carrots and garlic, some celery that’s overwintered. Change cooking time to accommodate brown rice. It was an excellent soup. I am just not seeing how it surpasses the more traditional Fall/Winter Soups. On the other hand, Mr. Big Food puts this soup at the top of his list of soups. He considers it a Soup Contest. Okay. Fine. Then explain to me why we disqualified Leftover Turkey Gumbo and Across the Garden Soup. It is a Fall/Winter Soup Contest. As I mentioned, things could get Logical around here. Links to soup contest stuff here.